This giveaway is now closed, but there is other good stuff in this post, so keep reading…the glaze on these veggies is yum! Today’s post is chockfull of great stuff. A recipe, helpful resources AND a giveaway. Are you ready? Let’s go! I cannot believe that Passover and Easter are NEXT WEEK. Where does the time go? I blame the Daylight Savings Fairy. Libby’s® Fruits & Vegetables recently contacted me about creating a side dish recipe for Easter and/or Passover that uses carrots, peas and corn. I thought and thought and decided candied vegetables would taste pretty darn good, especially with a little ginger thrown into the mix. So Little Chef Anna and I hit the kitchen and started creating. She looked into the big container of brown sugar and exclaimed in disbelief, “Brown sugar and salt and pepper?!? !” I assured her it would be delicious. Once she took a bite, she agreed! The glaze for these veggies would be delicious on a host of vegetables, not just carrots, peas and corn, although carrots lend themselves very nicely to this treatment. Feel free to experiment with your veggies! I like the salty sweet flavor and the ginger adds a nice layer of flavor. This side dish would be a nice complement to all kinds of Easter feasts! Libby’s, the company sponsoring today’s giveaway, has two new fabulous resources for you that help make the meal planning process easier and more inspiring. We wanted to share them with you today! Libby’s Pinterest Page: The Pinterest page is also brand-spakin’ new, featuring recipes, family activity ideas, nutrition tips and more! Now, the moment we’ve all been waiting for! Giveaway time! And we have MORE Le Creuset to share with you! One lucky, randomly-selected winner will receive a variety of Libby’s® Fruits & Vegetables product as well as a Le Creuset 10.5″ Oblong Grill Pan in Ink. Oh how I LOVE Le Creuset’s Ink. Leave a comment on this post. That’s it! Good luck with the giveaway! Big thank to Libby’s! And, without further ado, today’s recipe! Melt butter in a large pot over medium heat. Once butter is melted, add brown sugar, ginger, salt and pepper. Stir and cook for a few minutes, until sugar crystals are mostly dissolved (about 3 or 4 minutes total). Add veggies, stir and cook until vegetables are heated through. Serve immediately. Makes about 10-15 servings. This post was sponsored by Libby’s – payment was received for services rendered. So simple, yet so delicious looking! YUM! Easy + delicious + nutritious = winning combo for me! I’m following Libby’s on Pinterest! This recipe looks wonderful, will have to try it. Recipe looks great, will try it out this week!! And would love that amazing grill pan!!!! I would love a great grill pan! Thanks! I love glazed veggies, this looks great! The oblong shape is a smart design, eliminating the need to cram longer foods into square spaces. Good work, and stylish, also (as usual!). I liked Libby’s on Facebook. I followed Libby’s on Pinterest. Wow, I would love that pan! I love canned veggies! It comes from growing up with them…and my large stash of “food storage”:) This sounds yummy! That’s such a great pan! I’ve been admiring them from afar, and it would be lovely to have one. I have always wanted a LC grill pan! I follow Libby’s on Pinterest! I like Libby’s on Facebook! not a veggie eater but this looks great! So great that you created it with Anna. I’m a bit skeptical but if say its good, I’ll give it a try! I know some people love canned veggies and some people don’t. the glaze is just darn good and would be delish on whatever kind of veggie floats your boat – you could do fresh veggies steamed or blanched or maybe even roasted veggies. yum yum! 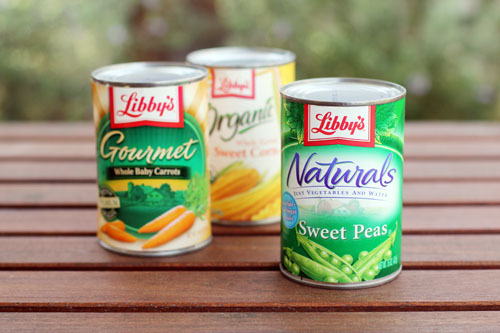 Love Libby’s canned veggies, great quality. This sounds wonderful! Candied anything with ginger would be a winner! Candied veggies are a nice way to add a special touch to a simple meat entree! Lots of flavor, and the kids like them too! I love all Le Creuset products! 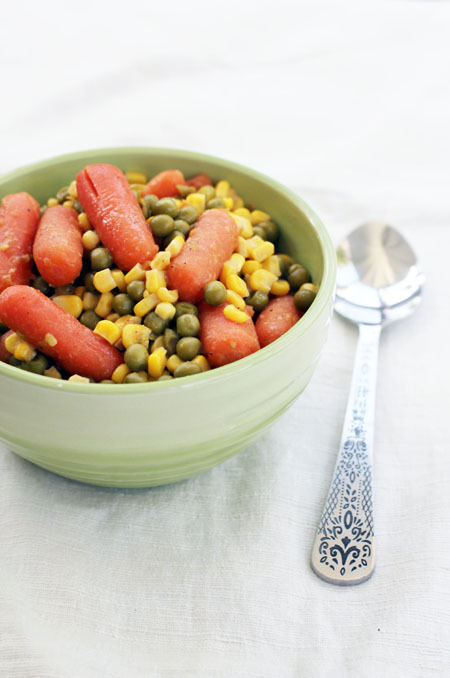 i never cook with canned veges, but maybe my kids would eat them with sugar on them? but, on a side note…i love your fork…is it vintage? reminds me of the forks my mom had growing up. if you bought it recently…tell me where! cost plus world market – bought them very recently! I love that grill pan! I follow Libby’s on Pinterest. That grill pan looks so great! I would love to win the Le Creuset 10.5”³ Oblong Grill Pan !!! What a beautiful grill pan! Love those veggies and love how the pan has sides that pour! I’ve always been a fan of Le Creuset, thanks for the giveaway! And I already like them on FB! I have had my heart set on a le creuset grill pan! These remind me of the brown sugar carrots my mom used to make when I was younger. Thanks for the walk down memory lane! That LC pan looks divine.. I have always wanted something LC.. maybe today is my lucky day! I’m diggin that pan… And will like on Pinterest. Yes, please! I have wanted a good grill pan for a long time! Can’t wait to try your recipe. Thanks for sharing! I love the ginger! And that fab oblong grill pan!! The ginger candied vegetables sound YUM! I will have to try them soon! That Le Creuset oblong grill pan is really cool ~ what a fun shape! I now follow Libby’s on Pinterest. The Le Creuset 10.5”³ Oblong Grill Pan is beautiful and Libby’s Fruits and Veggies are delicious! Thanks for the giveaway. I’m always on the lookout for different ways to egt my kids to eat their vegetables. Thanks for sharing the recipe! btw, that pan looks awesome! I like Libby’s on FB. Libby’s, Libby’s, Libby’s on the table, table, table!! I can’t wait to try the Ginger Glaze. And that pan – oh my! Love glazed carrots, and so I’m sure I’d enjoy all the vegetables together. Holy cow, that pan looks amazing! Le Creuset, what will you think of next? I love new veggie recipes. Thanks! The glaze is so easy and sounds great! Thanks for the giveaway! Love Le Creuset! Yummy–I’ve added this to the list for next week’s menu! And I followed Libby’s on Pinterest…. Canned veggies are so convenient! I grow up on canned veggies. Frozen ones are new to me. I didn’t even know they had a grill pan. This pan would get used! Love glazed carrots, so this should be even better! this is a great giveaway! Would that pan be good for grilled cheeses? I love your blog and recipe ideas! I love the ink Le Creuset color, too! That is one beautiful pan!! Awesome giveaway! Will have to try the veggies. ginger candied veggies sound yummy. Love the pan and we all need to eat more veggies! mmmMm…your candied veggies sound yummy! And I love the convenience of canned vegetables, especially during the winter when fresh is harder to come by. Thank you for the opportunity! Always looking new ways to serve veggies at meal time. Thanks. Oh, how I would love that pan! I will have to try this sounds – DELICIOUS!! Thanks for sharing. Love when I come check out your blog and stumble upon a give away. Le Crueset is a dream! Love the recipe…can’t wait to try it! That is one pretty pan! That pan seems so versatile! I would love to win it! Oh that grill pan is calling my name! I would loooove this! I used to have a cheaper version before moving and would appreciate a replacement! I follow Libby on Pinterest! Recipe looks great and I love the grill pan too! Some vegetables really stand up to being in an can, are almost better – like beets. Plus, have you peeled and sliced a beet lately? It’s not easy or fun, but I love to eat those bad boys. This candied veggies recipe sounds fantastic! I would give my husband’s false teeth to have a griddle pan in my cooking cache! I’ve always wanted one! I also follow Libby’s on Facebook. I could use some canned veggies in my pantry. Your ginger candied veggie recipe sounds tasty! And that pan is gorgeous. 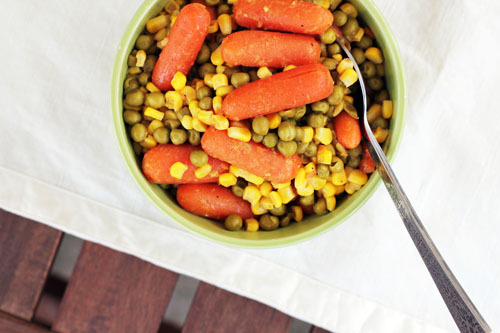 Thanks for the new recipe for canned veggies, & the chance to win the Grill pan. I NEEEEEEED this in my life. Seriously. Yummy! I would LOVE, LOVE a pan like that! what a cool grill pan! Those veggies were really awesome! I grew up on canned vegetables, and I still use them, along with fresh and frozen. I would LOVE to win that beautiful grill pan. Thanks! Oh, the things I could grill with that grill pan!